George H.W. Bush was to be laid to rest Thursday, concluding a four-day tribute to the 41st president that saw America briefly set aside its political divisions. After a state funeral Wednesday in Washington that was attended by the country’s five living presidents and foreign dignitaries, Bush’s flag-draped coffin was flown to Houston. He will lie in repose at St Martin’s Episcopal Church, where the Bushes worshipped for decades, until he is buried. Bush will be interred at his presidential library in College Station next to his wife Barbara, who died in April, and their daughter Robin who died of leukaemia at age three. At the memorial service President Donald Trump and First Lady Melania shared a front row pew in the National Cathedral with past presidents Barack Obama, Bill Clinton, Jimmy Carter and their wives as an honor guard brought Bush’s casket into the prayer hall. Former president George W. Bush tapped the casket twice when he walked up to deliver a rousing eulogy, fighting through tears as he sang the praises of his father and predecessor as commander-in-chief, who died Friday at age 94. “He showed me what it means to be a president who serves with integrity, leads with courage, and acts with love in his heart for the citizens of our country,” Bush said. “He was born with just two settings — full throttle, then sleep,” he said. “To us, his was the brightest of a thousand points of light,” he said in a reference to his father’s signature call to volunteerism. 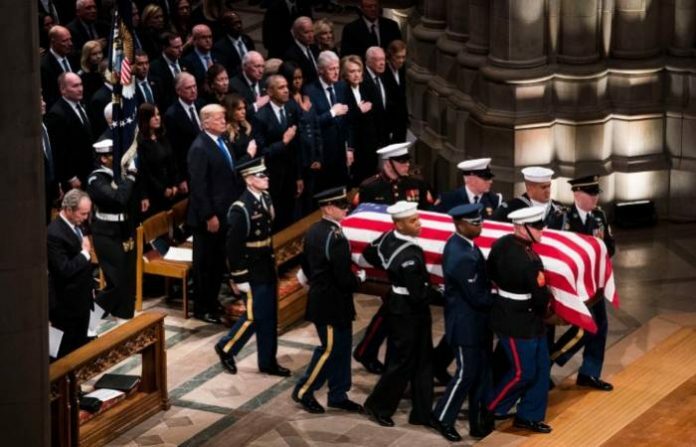 Wednesday’s funeral capped a national homage that saw Bush lie in state in the US Capitol rotunda, where thousands paid respects to a statesman who steered the nation through turbulent times including the end of the Cold War — and in a style dramatically different to the current president. “He will be missed!” Trump wrote. At the funeral, Trump and his Democratic predecessors appeared locked in an uneasy truce. Trump arrived and shook hands with Obama and former first lady Michelle Obama. But his greetings stopped there, and the body language turned cold as he failed to acknowledge Hillary Clinton, his defeated Democratic rival in 2016. Clinton stared straight ahead and the two made no eye contact. It was a marked contrast when Bush Jr. arrived minutes later and shook hands with the current and past presidents and their wives — and handed Michelle Obama a piece of candy, as he did during the memorial service for senator John McCain in the same cathedral in September. Bells tolled while the casket was carried down the aisle, as dignitaries including Britain’s Prince Charles, German Chancellor Angela Merkel, former Polish president Lech Walesa, and former US vice presidents and cabinet officials looked on. Bush was a decorated World War II aviator who nearly died when he was shot down on a bombing mission. He served as a congressman, envoy to China, director of the Central Intelligence Agency, and vice president to Ronald Reagan before winning the White House. Trump’s ascendancy to the head of the Republican Party saw him exchange vitriolic attacks with the Bushes, notably slamming the presidential son’s 2003 invasion of Iraq and mocking candidate Jeb Bush during the Republican primaries. Bush Sr meanwhile branded Trump a “blowhard,” and revealed he did not vote for him.